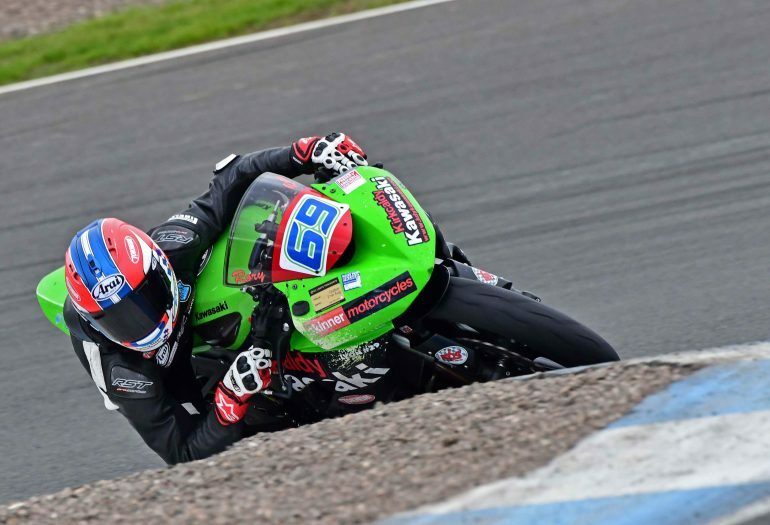 The Knockhill Motor Sports Club ended its 2018 season this weekend, with Perth rider Rory Skinner taking five wins out of five in the Formula 600 class on board his Kirkcaldy Kawasaki ZX-6R. Despite a forecast of dry weather all weekend, heavy rain saw Saturday afternoon’s two races held in difficult conditions with Rory triumphing both times. Sunday saw dry conditions for the three 600cc races and Rory was able to dip under the National Superstock 600 lap record he set during July’s Bennetts British Superbike Championship meeting as he rode to three more peerless victories. His five wins see Rory finish second in the KMSC Formula 600 championship, despite missing one of the four race weekends due to British Talent Cup commitments. Next weekend sees Rory make his second appearance in the Pirelli National Superstock 600 championship, racing the Bennetts Tokheim Kirkcaldy Kawasaki at Silverstone’s short National circuit. The following weekend sees another National Superstock 600 outing, at Cheshire’s Oulton Park, before returning to British Talent Cup duties at TT Circuit Assen, on the weekend of 28-30 September.